To answer this question, let's look at the definition of public speaking first. depending of the purpose or intention of your speech. Public speaking is such an integral part of our lives. Many people believe that public speaking is the arena for professional speakers only - yet the skill of being able to speak in public touches our lives more often than you think. Not everyone is a "born speaker". However it is very important that everyone nurtures and develops this very important life skill. The ability to speak in public is a life skill that can and should be developed. 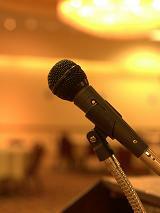 Here's wishing you many happy public speaking engagements.